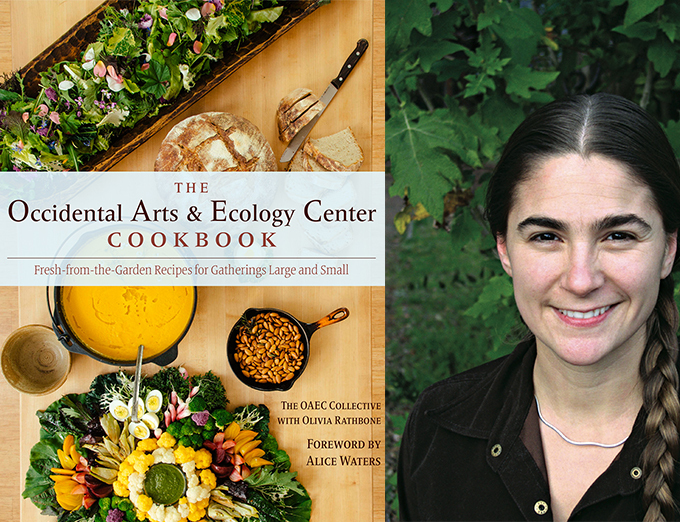 The new cookbook from the Occidental Arts and Ecology Center brings a community-centered approach to plant-based cooking. Every day, all the members of the intentional community at the Occidental Arts & Ecology Center (OAEC), gather in one place to eat together. Located in West Sonoma County, California, OAEC has long been at the forefront of ecological agriculture. One of California’s first certified organic farms, it has existed as a renowned demonstration farm, nonprofit educational retreat center, intentional community, and eco-think tank since the 1970’s. And the group has been eating, and growing food in their “Mother Garden” together for so long, that OAEC has also been pioneering its own cuisine over the years. The meals follow a template that speaks to their seasonal, plant-based approach to eating: one or two garden vegetable dishes, one protein dish, one carbohydrate, a side of pesto, spread or sauce, and a huge salad. The Center’s newly released cookbook celebrates 20 years of restorative farming, community building, ecological research, and amazing, earthy food. Recipes include unique fresh-from-the-garden pairings, like carrot and chamomile soup and loquat-ginger salad dressing, but the book is also much more than a collection of recipes. It includes thoughtful reflections on biodiversity (on the land and in the kitchen), stewardship, seed saving, community, eco-literacy, and social change. OAEC’s emphasis on community comes through in the recipes—each one is scaled to feed 4-6 people or as many as 30-40. Like many things done at OAEC, this cookbook was written collectively. We talked with Olivia Rathbone, the book’s editor and chief author and the kitchen manager at OAEC, about the inspiration behind it, the process of writing it, and what gardening can teach us about cooking. What inspired you to write the cookbook? This book came out of years of collective dreaming as well as nudging from visitors and friends who have always raved about the imaginative style of cooking birthed from this land. [OAEC] has been at the forefront of the ecological agricultural movement since the 1970’s, and food is one of the most accessible ways to bring home the bigger picture issues around water, social justice, seed sovereignty, etc. Telling the story of OAEC through the lens of food seemed only natural. How long did it take to put the cookbook together and how many people contributed to it? We worked for three years gathering stories, shooting photos, and testing recipes. There were over 50 current and former staff members, residents, and collaborators that contributed directly, so there was a lot of “cat-herding” involved. This was a deeply collaborative project, which is what makes the book—as a reflection of the OAEC collective—so rich. Is there a main idea you want readers to take away? These recipes are about discovering and creating a relationship with the land through time. Our mission and work is tied into the promotion of eco-literacy, and our guests get to experience, on a gut level, what sustainability tastes like. In the spirit of Carlo Petrini’s Slow Food “protest of pleasure,” we resist the industrialized food system not only through voicing our resistance to pesticide use, factory farming, and other unsustainable practices, but by living out the solution pathway and co-creating the kind of restorative, celebratory, land-based culture we want to see thrive. The variety of vegetables, herbs, and fruits grown at OAEC is truly amazing. How can a beginner gardener work towards cultivating a diverse, resilient kitchen garden at home? I encourage beginners to start by growing a few hardy perennial herbs like thyme, marjoram, rosemary or lemon verbena—they can be grown in pot or small space, are fairly indestructible, and can be incorporated into many versatile dishes. As you begin to build a daily give-and-take rapport with your plants, you can branch out to a mix of other crops—some that you enjoy eating and some that bugs and butterflies enjoy eating and you enjoy looking at or smelling. Talk to your neighbors! Share a meal with fellow gardeners to find out what does well in your area. What can gardening teach us about cooking? There is an old adage that kitchen gardeners live by: “What grows together goes together.” It’s pretty simple logic: Whatever happens to be fresh today is going to taste great with all the other things that are also fresh today. All rich, traditional food cultures are rooted in this agricultural truth. Think pasta primavera at the height of spring when peas, asparagus, green garlic, and parsley are peaking or ratatouille in late summer when eggplants, peppers, and tomatoes are abundant. In our kitchen, the most deliciously creative dishes are born out of a commitment to use what is available from the garden at that moment, and we hope to inspire others to find ways to make food that is authentic to their own place. Something unique about the OAEC kitchen garden is that it is also a seed–saving garden. Many gardeners have been taught to immediately pull out a plant once it has flowered—even the saying “gone to seed” has a negative connotation! In contrast, the OAEC gardeners and cooks use and celebrate plants in all stages of their lifecycle. Take arugula for example: It begins in the low-growing, classic rosette shape with mild and juicy leaves. Once the flower stalks shoot up and the leaves change, it might not be recognizable as “textbook” arugula, but we continue to harvest the leaves—they’re just smaller, spikier, and spicier—perfect for a green mustard sauce, for example. The piquant yellow flowers are not only prized by local pollinators, but by our cooks as well—we use them as edible garnishes for salads and other savory dishes. Even the seedpods themselves can be pickled! When the pods dry down, we finally harvest them to share at seed exchanges or plant in the nursery. Whatever is leftover is eaten by birds or drops to the earth and sprouts a carpet of new “volunteer” arugula next season. We harvest the baby sprouts for our salad mix and the cycle begins all over. Lastly, when you have beautiful produce that you or someone you love has grown, you know how much work went into growing it and you tend to treat it with a bit more care. There is an imperative to waste less and to really honor and highlight that ingredient in the dish. You’re known for your Biodiversity Salad Mixes. How do they symbolize the work OAEC does? Our famous “100 ingredient Biodiversity Salad Mix” is the crowning expression of OAEC’s food philosophy—diverse, beautiful, wild, and fresh. When guests experience our salad mix, it is an educational journey. Diversity is the very backbone of ecological resilience and, consequently, the key to food security. In a mono-crop situation, if a pest comes into the garden you can lose it all in one fell swoop; whereas when there are many different crops growing in the garden, you always have options—in our case, ingredients for the salad mix. Doug Gosling, the head gardener and Director of the Mother Garden Biodiversity Program, has loyally tended these gardens for over 30 years and has never picked the same salad twice! He says, “The salad mix is a snap shot of the garden on any given day.” The ever–changing components range from heirloom lettuce varieties to kales specifically bred by Doug to edible flowers and common garden weeds. I love the idea of eating pesto every day. How did that idea originate? Similar to the salad mix, it mainly came out of the fact that tender leafy herbs and greens, both wild and cultivated, do really well in our coastal micro-climate year– round. It’s a great way to tie the flavors of a meal together with what is freshest and most abundant in the garden. Michelle Vesser, OAEC’s long time production gardener and a trained herbalist, introduced the idea and has really encouraged us to embrace what are normally referred to as “weeds” and re-name them “gardener’s choice pesto herbs”! Was it difficult to write a cookbook when recipes are rarely used in the OAEC kitchen? We definitely had to become a lot more scientific in our approach. We are used to more or less winging it and relying on our ingrained sense of what Deborah Madison calls vegetable literacy to make dishes work with our unusual ingredients. We wanted people to have success with some solid basic recipes and then added lots of suggestions for variations so that they too could learn how to wing it with whatever is fresh in their area. Another reason we rarely use recipes is that there are very few books out there with accurate measurements scaled up to feed a crowd. As an intentional community where large gatherings centered around homegrown food are the norm, we wanted to write a book that would demystify cooking for groups. The book is sprinkled with tips from professional caterers on how to artfully use garden produce so that the common potluck, family reunion, and community gathering can be more like a farm-to-table event. I think the recipe that Gabriel Tiradani (the main recipe tester and author of many of the baked recipes) and I are the most proud of is the Bay Cheesecake. The crust is made from roasted wild California bay nuts and the custard is infused with the gentle vanilla notes of cultivated, European bay leaves. A family reunion of European bay, Laurel nobilis, and New World California bay. The culinary bay leaves imbue a warm vanilla flavor into the cream. This is a good dessert to serve after a dinner party where the guests might want a little waker-upper for the drive home. For a gathering of 30 to 40 guests, make three cheesecakes. For cheesecake, it is important that all ingredients be at the same temperature when mixing to ensure a creamy, unified texture. Set the ingredients out ahead of time to let them come to room temperature, and allow the infused cream to fully cool before mixing. Heat the cream, bay leaves, and 2 tablespoons of the sugar on the stovetop on medium-high heat until the cream barely begins to simmer. Reduce the heat and simmer for 20 minutes until the cream reduces by half for a total of 1⁄2 cup infused cream. Turn off the heat and cover. Leave the mixture to infuse until the liquid cools back down to room temperature. Remove and discard the bay leaves. Beat the room-temperature cream cheese until creamy and smooth, totally free of lumps. Then add the remaining sugar and the salt until incorporated. Scrape down the sides of the bowl and beat in the eggs one at a time, scraping the bowl between additions. Add the vanilla and cooled infused cream and beat until fully smooth. The batter will be a little runny, but it should set up during baking. Place the springform pan on a sheet tray. Bake at 325°F until golden brown on top and mostly set except for a silver-dollar-sized giggle in the middle. This should take from around an hour up to an hour and a half. Allow to completely cool so that the cake can really firm up. Remove from the springform pan when you’re ready to serve. This recipe is adapted from Olivia Rathbone’s The Occidental Arts & Ecology Center Cookbook (April 2015) and is printed with permission from Chelsea Green Publishing. Photos, from top: Olivia Rathbone headshot by Jim Coleman; Corn and Peppers by Tali Aiona; Peaches by Jim Coleman; Biodiversity Salad Mix by Doug Gosling; Bread by Tali Aiona; Bay Cheesecake by Tali Aiona.